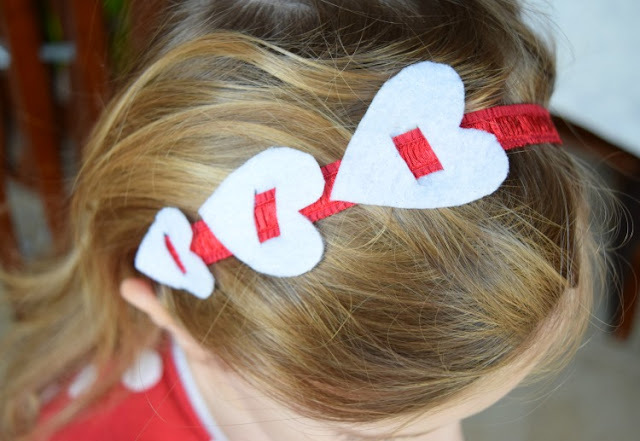 After my daughters made their paper Valentine Crowns recently, they kept wanting to wear them out of the house. I'm all for personal expression and individuality, but those suckers were staying home. 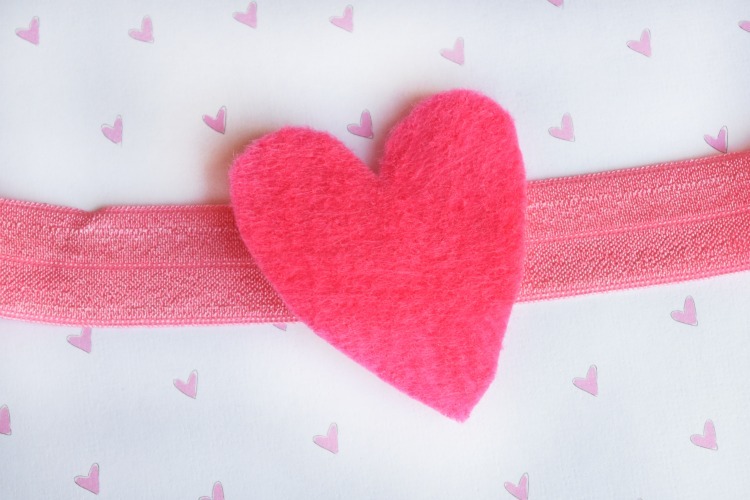 Instead, I adapted the project and made real Valentine Headbands that are perfectly suitable to wear anywhere! 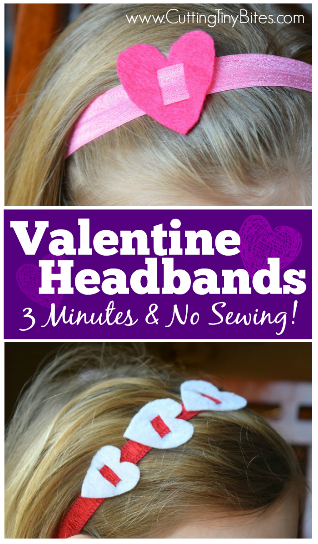 These Valentine's Day headbands and hair ties are SO quick and easy to make! I was able to made several headbands and ponytail holders in just a few minutes. Here's how to make them. Fold-over or ruched elastic - You'll get more bang for your buck if you purchase in bulk online. Since we didn't need 12 yards worth of headbands, I just headed to the craft store with some 50% off coupons and got a couple of yards of Dritz. The 1/2" or 5/8" width works well. Measure your child's head where the headband will go. 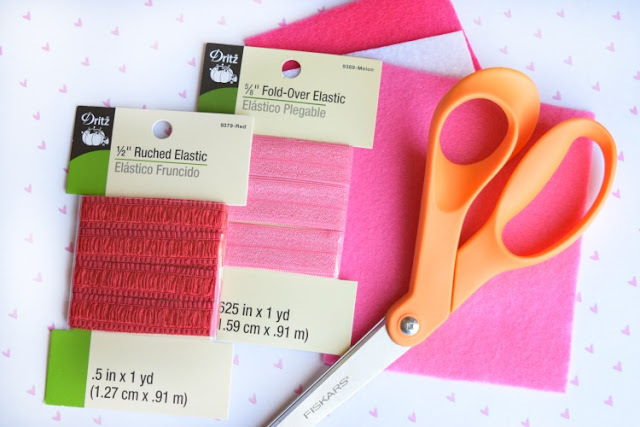 Keep the elastic neutral (not stretched) and cut it with about 2 inches overlap. 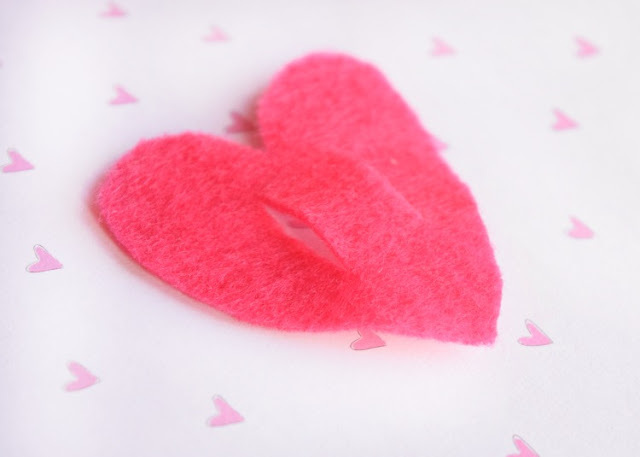 Next, cut simple heart shapes from your felt. You can eyeball it or find a template to trace. Cut two small slits in the heart. 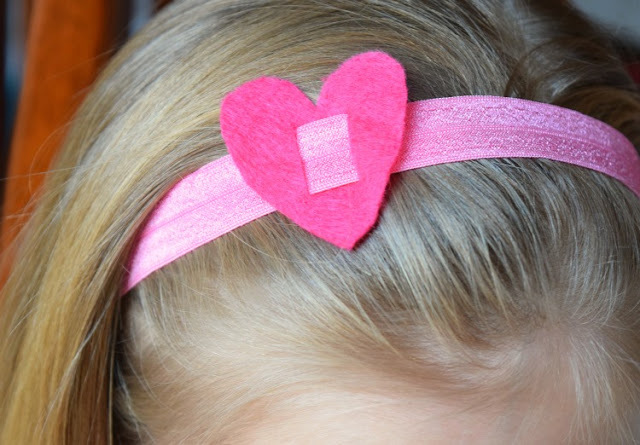 Vertical slits will make the heart lie horizontal on the headband. Horizontal slits will make the hearts lie vertical on the headband. Confusing, no? 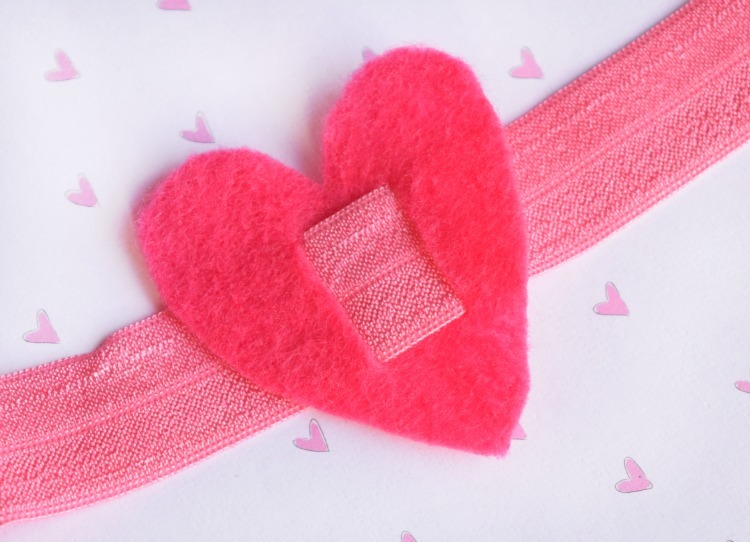 Thread the hearts onto the elastic. Tie a knot in the back, and trim any excess if you want. You can even go crazy and add LOTS of hearts! To make ponytail holders just scale the whole project down. Your elastic for a ponytail holder should measure about 8 inches, to give yourself room to tie a knot. 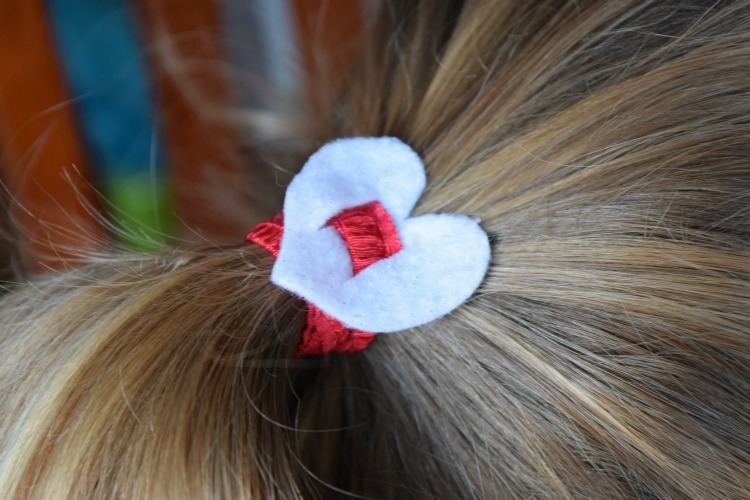 You may have to do a bit of fiddling to get the heart in the right place after you've fixed your ponytail, but it's easy to manage! These would be adorable to give out as party favors or simple gifts for friends! 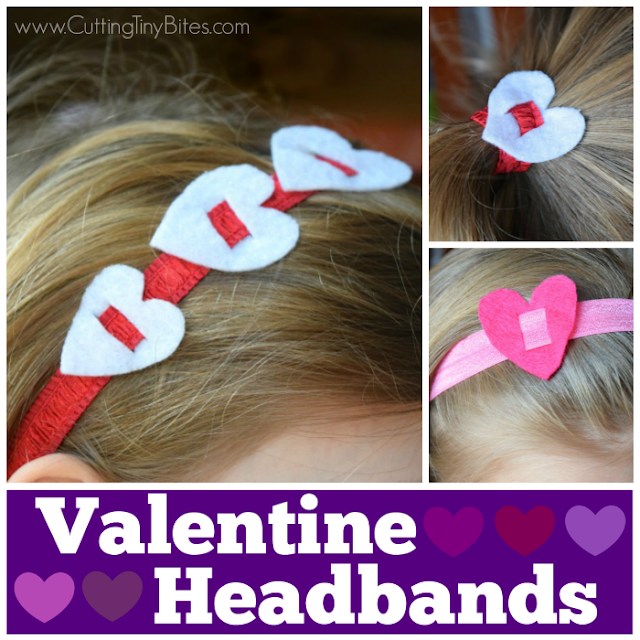 Quick and easy Valentine's Day Headbands. Make them in under 3 minutes, and requires no sewing! Make them in red, pink, and white with fold-over elastic!